16-Oct-2017: For decades, immortal cells such as the famous HeLa cells have been contaminating other cell cultures in the lab. As a result, scientific studies about certain cells are actually discussing other cells. Willem Halffman and Serge Horbach, researchers at Radboud University, found more than 30,000 publications on the wrong cells. HeLa cells are used in biomedical research around the world. HeLa was named after Henrietta Lacks, the woman whose cervical cancer cells were biopsied and used for medical research. Those cells were found to reproduce indefinitely in the lab, making them the world's first immortalised cell line and one of the most important and commonly used cell lines in medical research to this day. HeLa cells were thrust into the public eye in recent years thanks to the book and the made-for-TV film of the same name The Immortal Life of Henrietta Lacks. Unfortunately, HeLa cells have been contaminating other cell cultures for decades. Due to, for instance, carelessness in the lab these rapidly reproducing cells began taking over other cell cultures. This wasn't limited to HeLa alone, but was also observed in other immortal cell lines. 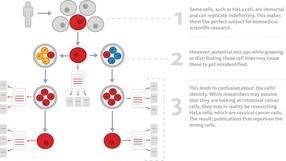 Researchers found more than 451 cell lines that were completely taken over by other cells. Large amounts of cell cultures have therefore been mislabelled. Biomedical researchers may think they're working with human cancer cells, when in fact the majority have been taken over by mouse cells. This leads to the publication of scientific articles in which the authors report what they believe to be their findings on skin cancer in humans, whereas their assumptions were based on studying mouse cells. In many cases, the researchers don't even know a mistake has been made. Nijmegen researchers Willem Halffman and Serge Horbach wanted to know how big this problem really was. "We researched what happened to scientific publications about misidentified cell lines from 1955 on," Halffman explains. "Many of these still list the wrong cells online and are often cited by other authors. After an extensive literary study, we believe this involves some 33,000 publications. That means there are more than 30,000 scientific articles online that are reporting on the wrong cells," he adds. "Most scientists don't intentionally publish findings on the wrong cells," says Serge Horbach. "It's an honest mistake. The more concerning problem is that the research data is potentially invalid and impossible to reproduce. What's even scarier is that we've known about these wrongly identified cells for half a century, yet many researchers aren't aware of this. New articles are published every week about misidentified cells." 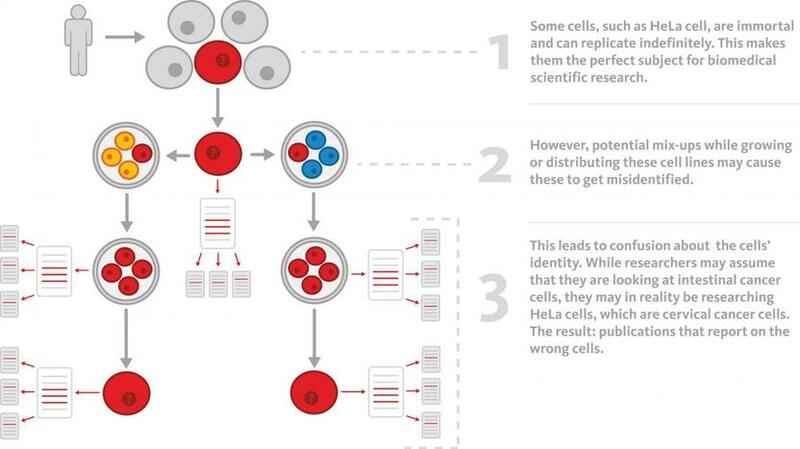 Many biomedical experts don't know about the 451 misidentified cell lines. Cell distribution centres play an important role, as this is where many researchers get their cells. "Employees at these centres recognise the problem, but claim no one will listen to them. They're angry," says Halffman. "Sometimes it involves semi-private companies that refuse to disclose anything for fear of reputation or financial damage. The biggest factor by far is pride and fear of reputation damage." Various initiatives have been developed over the years to prevent the exchange of cell cultures, such as better protocols and hygienic fume cupboards. The scientists can carry out a genetic test before starting their research to detect misidentified cells. But that takes time and money. "The scientists I spoke to said that was the biggest problem," says Halffman. "And to solve that problem, you either have to reduce the pressure to publish or require all researchers to carry out a genetic test before working with the cells." "It's not our intention to damage anyone's reputation with this publication. It's about the overarching problem: what are we going to do about the mistakes that have been made? That's all we want to determine. One solution would be to put a disclaimer on all 30,000 publications explaining that they report on the wrong cell line. It would then be up to readers to decide whether it's a problem or not, because sometimes it really doesn't matter. Basically, we want to caution people to be careful with the interpretation of results. Then again, labelling problematic papers also takes time and money," say Halffman and Horbach.